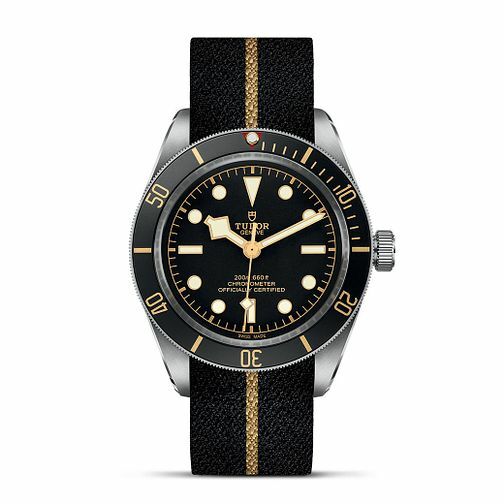 Boasting a 39mm polished case, the Black Bay 58 model timepiece by Tudor combines vintage with contemporary. Inspired by the brand's original diver watches, a domed sapphire crystal protects the domed black dial. The chronograph bezel co-ordinates with the hour indexes, hands, and finishing touch of the black and cream woven fabric strap. Style, functionality and comfort combined. This watch is waterproof up to 200 metres. Designed and manufactured in Switzerland, each Tudor watch is individually handcrafted. An exemplary brand synonymous with Swiss perfection.